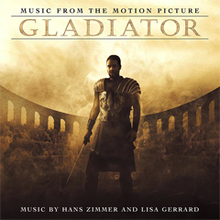 On February 27, 2001, nearly a year after the first soundtrack's release, Decca released Gladiator: More Music From the Motion Picture. This CD contained an additional 18 cuts from the film (including remixes of earlier scores, such as "Now We Are Free"). Many tracks also use dialogue from the movie, such as Maximus Decimus Meridius' quote "Father to a murdered son, husband to a murdered wife... and I will have my vengeance." Hans Zimmer's style influenced many composers, who used elements like female wailing vocals and the "battle waltz" for ancient war movies that followed. In April 2006, a law firm representing the Holst Foundation filed a lawsuit claiming that Zimmer had infringed the copyright of Gustav Holst's The Planets. "The Battle" from the score was claimed to infringe the copyright on "Mars, the bringer of war". The Track "Barbarian Horde" reprises most of these themes. The "Il gladiatore" version of this song, was performed by Andrea Bocelli during the 2009 UEFA Champions League Final in Rome, where FC Barcelona defeated Manchester United F.C. and also during the 2016 UEFA Champions League Final in Milan. ^ "Canadian album certifications – Hans Zimmer – Gladiator". Music Canada. Retrieved 22 April 2017. ^ "Italian album certifications – Artisti Vari – Il Gladiatore" (in Italian). Federazione Industria Musicale Italiana. Retrieved 22 April 2017. Select "Tutti gli anni" in the "Anno" drop-down menu. Select "Il Gladiatore" in the "Filtra" field. Select "Album e Compilation" under "Sezione". ^ "Polish album certifications – Soundtrack – Gladiator" (in Polish). Polish Society of the Phonographic Industry. Retrieved 22 April 2017. ^ "TOP 100 ALBUMES 07 39" (in Spanish). PROMUSICAE. Retrieved 22 April 2017. ^ "The Official Swiss Charts and Music Community: Awards (OST; 'The Gladiator')". IFPI Switzerland. Hung Medien. Retrieved 22 April 2017. ^ "Official Charts on Twitter". twitter.com. 7 September 2017. Retrieved 20 October 2017. Hello! According to our data, it's the Gladiator OST, which reached No.17 in 2000 – 351,000 sales. ^ "British album certifications – Hans Zimmer & Lisa Gerrard – Gladiator - OST". British Phonographic Industry. Retrieved 22 April 2017. Select albums in the Format field. Select Platinum in the Certification field. Type Gladiator - OST in the "Search BPI Awards" field and then press Enter. 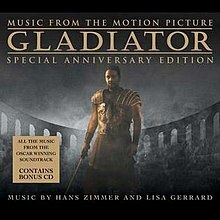 ^ "British album certifications – Hans Zimmer & Lisa Gerrard – Gladiator - OST - Special Anniversary". British Phonographic Industry. Retrieved 22 April 2017. Select albums in the Format field. Select Silver in the Certification field. Type Gladiator - OST - Special Anniversary in the "Search BPI Awards" field and then press Enter. ^ "American album certifications – Soundtrack – Gladiator". Recording Industry Association of America. Retrieved 22 April 2017. If necessary, click Advanced, then click Format, then select Album, then click SEARCH. ^ Schweitzer, Vivien (June 15, 2006). "Holst Foundation Sues Film Composer for Copyright Infringement". Playbill. Retrieved July 26, 2018. ^ Beek, Michael (June 2006). "Gladiator Vs Mars-Zimmer is sued". Music from the Movies. Archived from the original on 2007-12-30. ^ "For Pavarotti, Time To Go 'Pop'". Billboard magazine. November 1, 2003. Retrieved 27 June 2017. This page was last edited on 15 October 2018, at 05:02 (UTC).